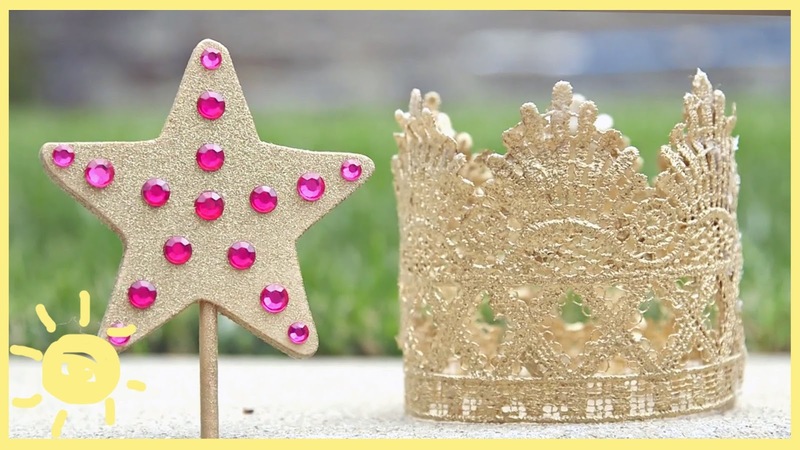 Whether you’re having a Princess themed party or just have a princess obsessed little one, these DIY’s are sure to be a hit!! the mothers from What’s Up Moms have found a way to recreate that Disney magic, demonstrating several clever projects for the ultimate princess party, including a Rapunzel-like braid and a golden glittery crown. The best part is that none of these DIYs require anything beyond everyday arts and crafts materials. What’s a princess without her long mane? Help your own little princess replicate this classic fairy tale look with a homemade hair piece. A roll of yarn in the color that matches the hair of your little one’s favorite princess. Wrap yarn around the poster board to make it easier to cut “hair” strands. Once the roll of yarn is completely wrapped around the poster board, cut it all on one end. Grab all of the yarns so the ends stay even and bind them together with a hair tie. Add a couple of pieces of ribbon, roughly the same length of the yarn strands. Divide the yarn into three sections (making sure to include the ribbons in two of the sections)and braid it. Once the braid is done, bind the end with a second hair tie. Trim both ends of your creation. A the top of your braid, trim close to the hair tie but, at the bottom of the braid, keep the trimming minimal. Take the top of the braid and make a loop that will function as a headband. Secure it with a ribbon. Tie another ribbon at the bottom to cover up the hair band. Glue on embellishments, especially at the top to cover the seam of the headband loop. The result is a professional-looking headpiece that is much cheaper to make than to buy online…and who doesn’t love a thrifty princess? Nothing says royalty like a sparkly crown. Cut the lace trim into a strip of 8 to 12 inches. Fill a bowl with fabric stiffener and saturate the lace strip. Roll up the lace and squeeze out the excess fabric stiffener. Lay it on a piece of parchment paper to dry. Paint a thin layer of Mod Podge over the lace. Lay it on a clean piece of parchment paper or Saran wrap. Add glitter. Let it sit for about 10 minutes then lift it up and flip it over a couple of times on the parchment paper to really saturate it in glitter. Form a circle with your strip and attach the two ends together with hot glue gun. These crowns are great for any old dress-up activity, but they also make a neat alternative to the traditional birthday hat. With just a little prep work on your end, making princess wands can be a great party activity! Spray paint your wands in the color of your choice. Let dry. Glue glitter and embellishments on the wands for a magically fun time!